The badminton backhand is a very difficult skill to master. Many badminton players, including world class players, find it difficult to execute strong backhands. Therefore a smart opponent will always force you to use your backhand so that you return a weak shot and hence his chance to perform a strong offensive shot. This is also a reason why you should be able to perform at least a decent backhand. This technique is usually used for defence. 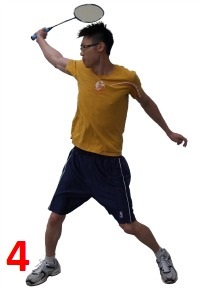 The backhand clear and backhand drop is similar to the forehand badminton clear and forehand badminton drop shot, except that you use your backhand stroke instead of your forehand.But it also can be used as an offensive shot in certain situations — for example, when you get the chance to strike with a backhand smash at the front of the court. Don’t worry about the backhand smash at the moment. Develop a strong backhand clear and backhand drop first. 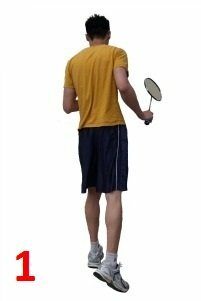 Once you master the correct technique to perform a good badminton backhand shot, you’ll be able to do execute other types of quality shots with your backhand. This is because the correct way of holding the racquet is the KEY to performing a strong backhand. A backhand clear and backhand drop shot uses similar technique. The only difference is the strength associated with performing these 2 different shots. A backhand clear requires a lot of strength, whereas backhand drop is fairly easier to perform. Therefore, train the backhand drop shot first to master the correct backhand technique. 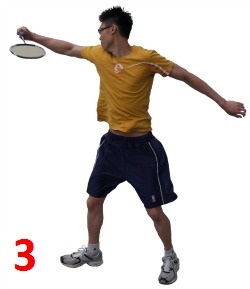 Then gradually increase your strength over time and try to do a backhand clear. If you still can’t perform a backhand clear even after a period of training, your backhand technique must be wrong. I’m sure that it’s not because you’re not strong enough. 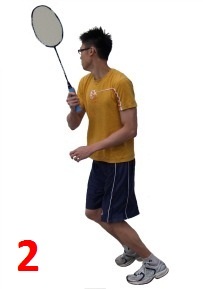 DO NOT perform a badminton backhand as if you’re doing a tennis backhand. You won’t be able to generate enough power that way (Hint: The power comes from the push of your thumb and the flick of your wrist). This is the most common mistakes among beginners. Do not use your backhand unless your opponent forces you to do so. Only use the backhand if you cannot reach the shuttle with a forehand stroke in time. Not many people can do a backhand clear from one end to the other end of the court (even some professional players find this difficult). If you are one of those who is forced by your opponent to use your backhand, do a backhand badminton drop instead.